If you’re a moderately experienced mountaineer who’s ready for their next big adventure, come with GoTrek to the volcanoes of Mexico! We’ll lead you on a stunning, unforgettable, and challenging climb and also facilitate an authentic experience of Mexico’s culture and history. At Go Trek, we believe that mountains don’t exist in a vacuum—the physical landscape is also a major part of a cultural landscape, and to have the most sincere experience of summiting a peak you should also take time to understand the thousands of years of human history surrounding it. For all aspects of mountaineering, from the technical to the cultural, you could not ask for a better guide than Craig Van Hoy. 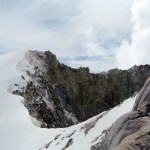 Craig has had one of the top mountaineering careers among North American climbers. He’s conquered all Seven Summits, the highest peaks on each continent, was in the first American team to summit Kangchenjunga, the world’s third highest mountain and with the world’s highest mortality rate, and he’s climbed more Mexican volcanoes than any other American guide. He’s also fluent in Spanish, has exemplary local guide connections you can count on, and is closely acquainted with Mexican cities and culture. 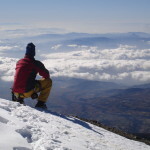 If you want to go on a Mexican trek expedition, you should choose a guide who speaks the language, knows the slopes like his own backyard, and is devoted to creating the most fulfilling and safest possible climb for his clients. 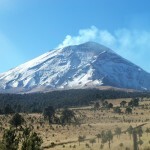 Our Mexican Volcano expedition includes North America’s third highest mountain, El Pico de Orizaba, and also its seventh highest, Iztaccihuatl. 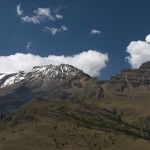 Both are multi-day climbs that will challenge you but offer breathtaking views and glacier experience you won’t be able to find anywhere else. We’ll also be visiting several important Mexican cultural destinations along our journey, beginning with the Teotihuacán Pyramids, built 2,500 years ago and which include the Aztec’s famous Pyramid of the Sun. We’ll spend time at the Museum of Anthropology in Mexico City to prepare an understanding of Mexico’s history and the significance of its volcanoes, and also visit the historic colonial city of Puebla. 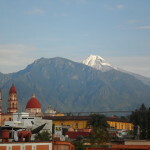 At the base of Orizaba, we’ll see a small Mexican village called Tlachichuaca, which will provide an excellent contrast with our time in the bustling Mexico City, the largest metropolitan area in the Western hemisphere. 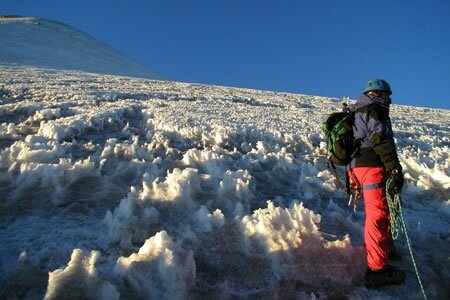 Our Mexican Volcano trek is less rigorous than any of the Seven Summits, but provides a substantial challenge and requires knowledge of high-altitude mountaineerings. 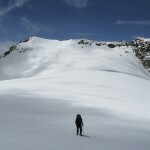 The climb will require extended cramponing, and experience with ice axe arrest and rope team travel are required. If you’ve experienced other significantly demanding or dangerous climbs, like Mount Rainier or Denali, and you’re looking for the next step in an international setting, this is the perfect trip for you. 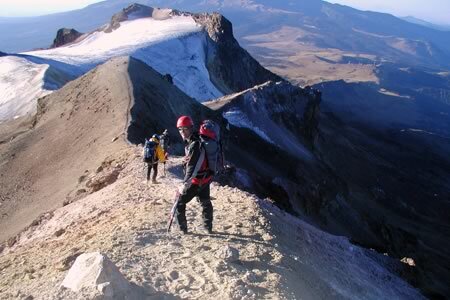 Contact Go Trek to learn more about our Mexican Volcano trek. It’s a once in a lifetime experience, and you should choose a guide who understands the land, the people, and the art of a successful expedition.